Batman and Robin escape Catwoman's trap by hitting the precise note needed to shatter the glass chamber in which they're prisoners. They quickly get on the trail of Catwoman. 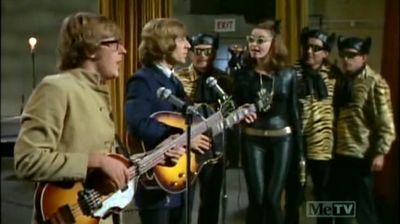 The feminine feline criminal eventually "steals" the voices of Chad and Jeremy, Commissioner Gordon and talk-show host Allen Stephens. She blackmails the British government, which faces the lost of revenue from the taxes on Chad and Jeremy's performances. Batman and Robin eventually capture Catwoman and her gang, but not before Batman and Catwoman express obvious affection for each other.